The competition is open to all high school and college students (15-20 years old) of General Santos City. Each team is composed of two members. Teams will promote themselves or their school through RAP. Each team is free to say anything except explicit curse words. Cursing is subject for disqualification. The statements should have rhyming words in their endings. Statements should be in Filipino or Bisaya. Before the teams will battle, they are given 1 minute and 30 seconds to present their original RAP song. 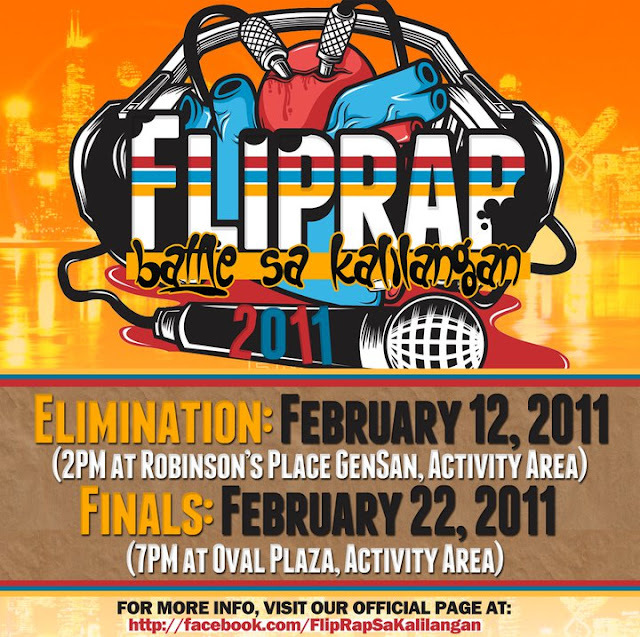 Participants must provide their own beat/rap music. There are three (3) rounds in each match. Each team is given 1 minute to say everything they can. Once the team’s time is up, it is opponents turn to present. After the three (3) rounds, the judges will state their opinions and vote for the winner. The team with the most number of votes wins the battle. An elimination screening will be conducted to choose the 8 teams who will qualify for the finals.